Having ticks removed is pure bliss. 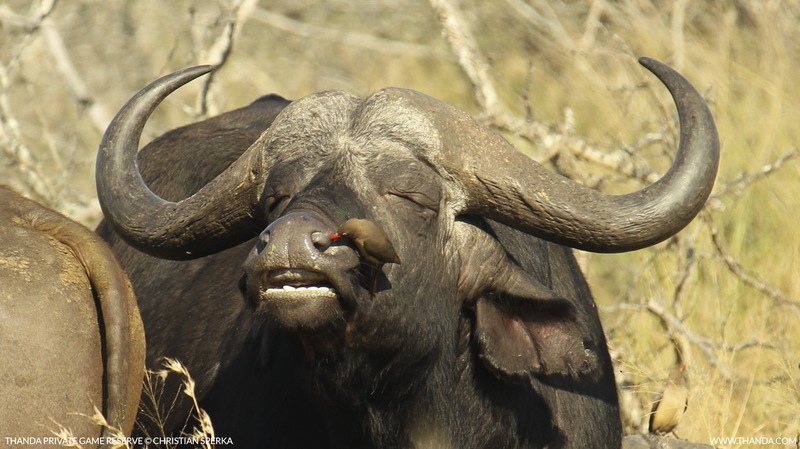 This Cape Buffalo bull enjoys the Red-billed Oxpecker’s treatment. The small birds live in a truly symbiotic relationship with big mammals. The Oxpeckers gain a great food source and the Buffalo get rid of annoying parasites. Thanda guests always enjoy watching this bush partnership. Hello there Christian, welcome back! It seems as if Thanda comes to a stop when you are not there, looks like you need to train someone to do the blogs, as they were missed!!! For sure one pleasurable moment for the Cape Buffalo. Question, Do the Cape Buffalo have upper teeth? From the picture they don’t appear to have any. Have A Great One. Hello Lisa – Thanks for your comment/question – You are correct Cape Buffalo (as most ruminants) have no upper teeth!